rockin moroccan night | I Should Cocoa! My big brother came to town to absorb some Cali culture and I had to have a flawless welcome plan. My brother lives in Singapore and has all of the amazing flavors of SE Asia at his doorstep, so I decided to draw from a cuisine that he probably doesn’t get too much of at home but is as bold, flavorful and complex as the cuisine of SE Asia to appeal to his palate: Moroccan. 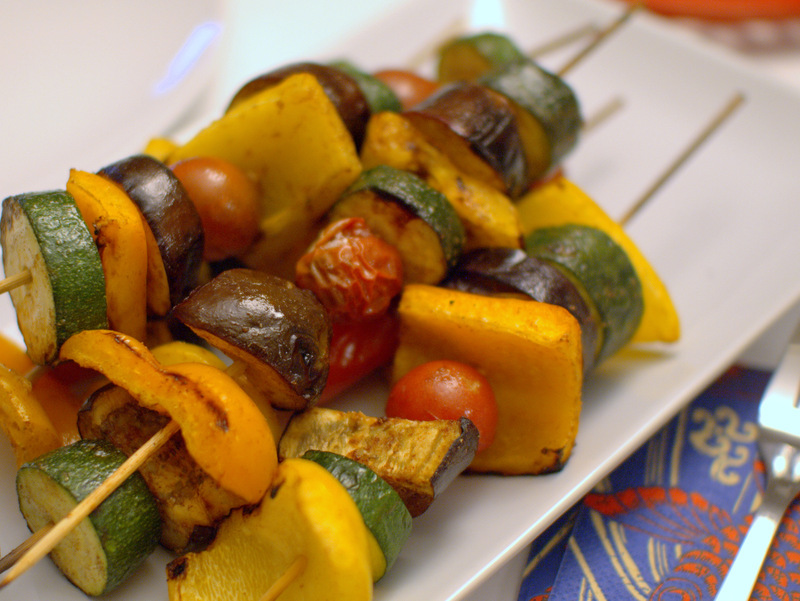 This grilled fish and veggie kebabs recipe allowed me to finally break into one of my favorite cookbooks, the gorgeous Modern Moroccan, and also to practice some more on the grill. The only specialty non-substitutable ingredients you need are preserved lemons and harissa, a spice mixture. You can easily make your own preserved lemons, but you’d have to do it months in advance. Like me, you can buy the stuff at a specialty grocer (Whole Foods had some) or a Middle Eastern store. The original recipe is for an appetizer serving of whole red mullet, but this recipe makes plenty (like, a lot!) for a dinner serving. I had originally wanted to use a firm white fish like halibut but salmon seemed like an easy way to grill fish without too much worry and the flavors worked amazingly well with this richer fish. The chermoula is bright and fresh, and the stew of veggies with preserved lemons is a complex layering of acidic, umami-savory, briny, and tart. The salmon grilled in its skin turned out really moist and perfectly done to a flaky medium rare. I know there are skin-down and skin-up controversies, but I found leaving the salmon skin down and shutting the lid of the grill made a really moist fish that was not overcooked even despite varying thicknesses of fillets. 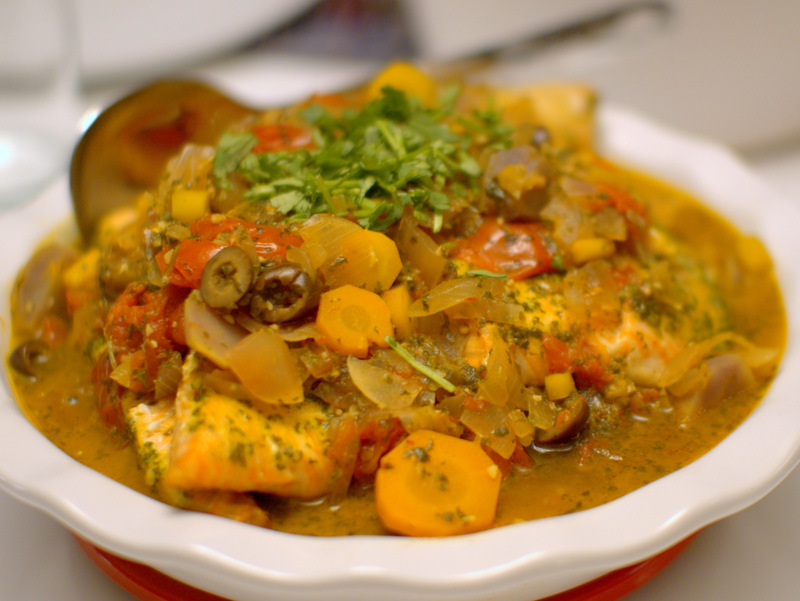 It was simple to slide the salmon off the skins and then ladle the stew with veggies over the fish to serve family-style. You can serve this over fluffed up garlic infused couscous for a complete Moroccan meal. For my stew i added purple potatoes, rainbow carrots, and vibrant heirloom tomatoes off the vine for even more color. The veggies have the Moroccan inflected flavor of tart lemon and aromatic cinnamon which is simply fresh and slightly subtle. The yogurt dip is perfect for dipping the grilled veggies in, or as we did, mixed into the couscous and salmon stew. Its a simple dip with a nice peppery kick from the harissa that would be great for other uses – pita chip dip, topping a baked potato – that makes it certainly worth hunting down a jar or tube of harissa. Preheat the grill on the hottest setting. Put all the vegetables in a bowl. Mix the ingredients for the vegetable marinade together and pour the mixture over the vegetables. 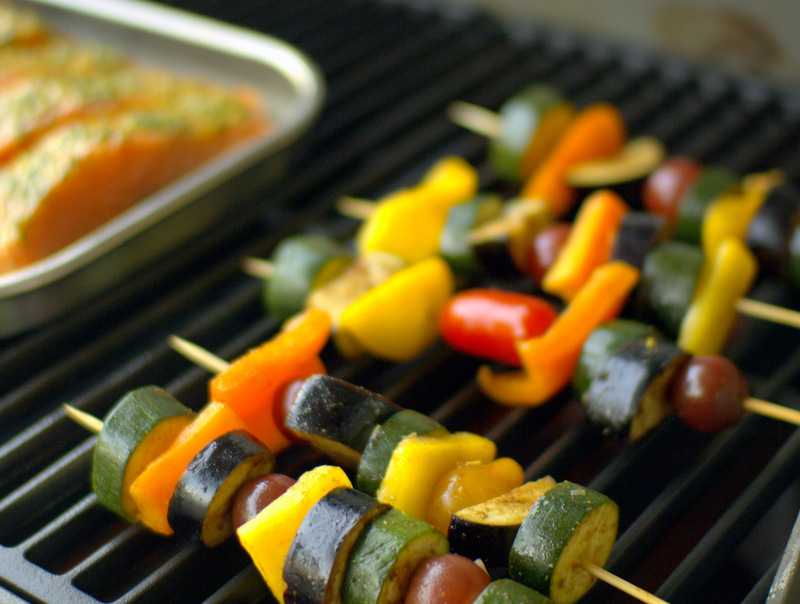 Using your hands, turn the vegetables gently in the marinade, then thread them onto metal or water-soaked wooden skewers. Cook the kebabs on the grill, turning them occasionally until the vegetables are nicely browned over. To make the dip, put the yogurt in a bowl and beat in a tablespoon of harissa, making it as fiery as you like by adding more harissa. Add most of the cilantro and mint, reserving a little to garnish, and season well with salt and pepper. To make the chermoula, process the ingredients together in a food processor then set aside. Heat the olive oil in a pan. Add the onion and carrot and cook until softened but not browned. Stir in half the preserved lemon, along with 2 Tbsp of the chermoula, the tomatoes and the fish stock or water. Bring to a boil, then reduce heat, cover and simmer for about 30 minutes. Add the potatoes and simmer for a further 10 minutes, until they are tender. 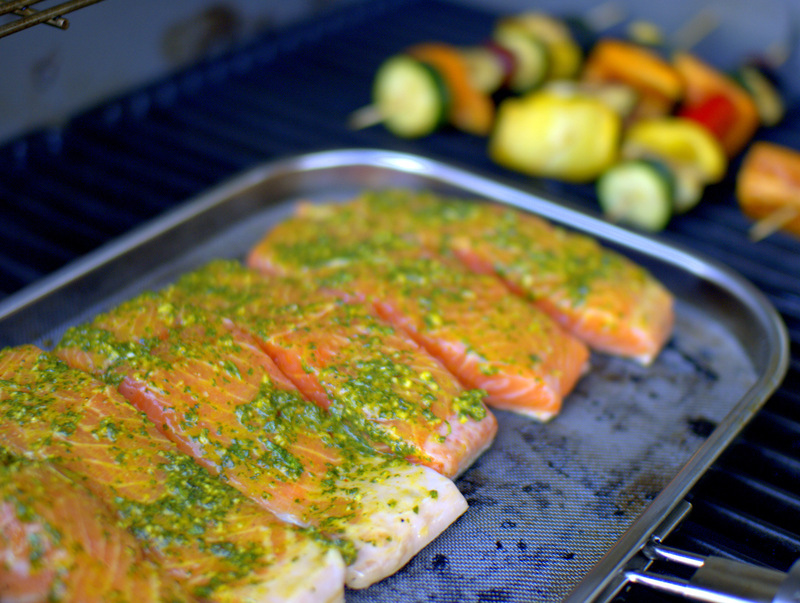 Preheat the grill on the hottest setting and brush a grill pan with oil. Brush the fish fillets with olive oil and a little of the chermoula. Season with salt and pepper, then place the fillets, skin side down, on the pan and cook with lid closed for 10 minutes per 1 inch thickness. Meanwhile, stir the olives, the remaining chermoula and preserved lemon into the sauce and check the seasoning. Slide a spatula to separate the fish from the skin and serve the fish fillets in wide bowls, spoon the sauce over and sprinkle liberally with chopped cilantro and mint. 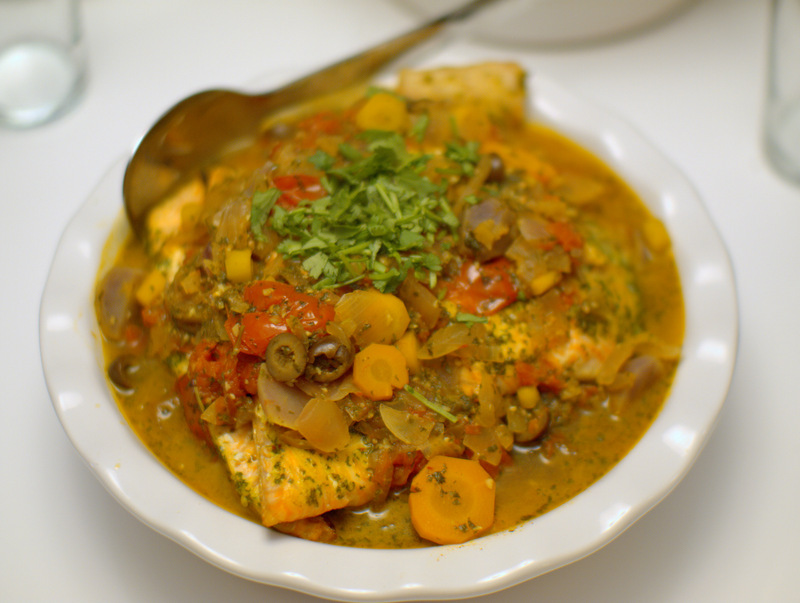 This entry was posted in lunch/dinner and tagged chermoula, fish, grilling, lemon, moroccan, salmon, vegetarian. Bookmark the permalink. wow! you really impressed your brother greatly . it was so delicious !! Pingback: almonds and roses and oranges – oh, my « I Should Cocoa! Pingback: what i had for dinner: condiment cleanout edition « I Should Cocoa!